Hamedi, A., Zomorodian, K., Safari, F. (2015). Antimicrobial activity of four medicinal plants widely used in Persian folk medicine. Research Journal of Pharmacognosy, 2(1), 25-33. A. Hamedi; K. Zomorodian; F. Safari. "Antimicrobial activity of four medicinal plants widely used in Persian folk medicine". Research Journal of Pharmacognosy, 2, 1, 2015, 25-33. Hamedi, A., Zomorodian, K., Safari, F. (2015). 'Antimicrobial activity of four medicinal plants widely used in Persian folk medicine', Research Journal of Pharmacognosy, 2(1), pp. 25-33. Hamedi, A., Zomorodian, K., Safari, F. Antimicrobial activity of four medicinal plants widely used in Persian folk medicine. 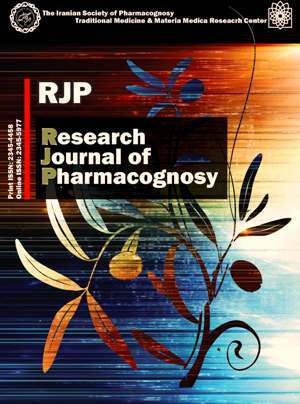 Research Journal of Pharmacognosy, 2015; 2(1): 25-33. 2Center of Basic Researches in Infectious Diseases, School of Medicine, Shiraz University of Medical Sciences, Shiraz, Iran. 3Student Research Committee, School of Pharmacy, Shiraz University of Medical Sciences, Shiraz, Iran. Background and objectives: Commiphora habessinica (O.Berg) Engl. (Burseraceae), Boswellia sacra Flueck (Burseraceae), Phoenix dactylifera L. (Arecaceae), and Doronicum glaciale (Wulfen) Nyman (Asteraceae) are of ethnomedicinal importance in Persian folk medicine and are widely used to treat infectious diseases. The aim of the present study was to investigate the antimicrobial properties of these herbal medicines to prevent misadministration. Methods: Antifungal and antibacterial (Gram-positive and Gram-negative) activities of the petroleum ether, dichloromethane and ethanol fractions obtained from oleo-gum-resin of C. habessinica and B. sacra, spathe of P. dactylifera and roots of D. glaciale were evaluated against standard species and clinical antibiotic resistant isolates using broth microdilution method. The fractions were tested at concentrations of 0.5 to 256 µg/mL.Results: The petroleum ether fraction of C. habessinica oleo-gum-resin exhibited the most anti-Candida activity with MIC50 of 0.5-16 µg/mL. The growth of C. glabrata and C. tropicalis was inhibited by the ethanol fraction of C. habessinica oleo-gum-resin with MIC50 of 1-16 μg/mL. C. glabrata was the most susceptible species. Among the tested fractions, only the petroleum ether fraction of C. habessinica oleo-gum-resin had an inhibitory effect on Aspergillus spp. with a MIC50 of 8-32 µg/mL. None of the fractions exhibited antimicrobial activity against the Gram-positive and Gram-negative bacteria at concentrations of 0.5 to 256 µg/mL. Conclusions: The sensitivity of fungi and bacteria to natural antimicrobials varies widely within species and it is essential to consider the sensitivity of the strains to prevent resistance. Nascimento GG, Locatelli J, Freitas PC, Silva GL. Antibacterial activity of plant extracts and phytochemicals on antibiotic-resistant bacteria. Braz J Microbiol. 2000; 31(4): 247-256. Costelloe C, Metcalfe C, Lovering A, Mant D, Hay AD. Effect of antibiotic prescribing in primary care on antimicrobial resistance in individual patients: systematic review and meta-analysis. BMJ. 2010; 340: 1-11. Dogan HH, Duman R, Özkalp B, Aydin S. Antimicrobial activities of some mushrooms in Turkey. Pharm Biol. 2013; 51(6): 707-711. Fenical W, Jensen PR. Developing a new resource for drug discovery: marine actinomycete bacteria. Nat Chem Biol. 2006; 2(12): 666-673. Khan R, Islam B, Akram M, Shakil S, Ahmad AA, Ali SM, Siddiqui M,Khan AU. Antimicrobial activity of five herbal extracts against multi drug resistant (MDR) strains of bacteria and fungus of clinical origin. Molecules. 2009; 14(2): 586-597. Brown JC, Jiang X. Prevalence of antibiotic-resistant bacteria in herbal products. J Food Protect. 2008; 71(7): 1486-1490. Girish H, Satish S. Antibacterial activity of important medicinal plants on human pathogenic bacteria-a comparative analysis. World App Sci J. 2008; 5(3): 267-271. Aliero A, Ibrahim A. Antibiotic resistance and the prospects of medicinal plants in the treatment of salmonellosis. In: Kumar Y, ed. Salmonella - A diversified superbug. Croatia: InTech, 2012. Hamedi A, Mohagheghzadeh A, Rivaz S. Preliminary pharmacognostic evaluation and volatile constituent analysis of spathe of Phoenix dactylifera L.(Tarooneh). Phcog J. 2013; 5: 83-86. Aghili M. Makhzan-al-Advia. Tehran: Tehran University of Medical Sciences, 2009. Badria FA, Mikhaeil BR, Maatooq GT, Amer MM. Immunomodulatory triterpenoids from the oleogum resin of Boswellia carterii Birdwood. Z Naturforsch C. 2003; 58(7): 505-516. Yoshikawa M, Morikawa T, Oominami H, Matsuda H. Absolute stereostructures of olibanumols A, B, C, H, I, and J from olibanum, gum-resin of Boswellia carterii, and inhibitors of nitric oxide production in lipopolysaccharide-activated mouse peritoneal macrophages. Chem Pharm Bull. 2009; 57(9): 957-964. Chevrier MR, Ryan AE, Lee DY-W, Zhongze M, Wu-Yan Z, Via CS. Boswellia carterii extract inhibits TH1 cytokines and promotes TH2 cytokines in vitro. Clin Diagn Lab Immun. 2005; 12(5): 575-580. Mothana RA, Hasson SS, Schultze W, Mowitz A, Lindequist U. Phytochemical composition and in vitro antimicrobial and antioxidant activities of essential oils of three endemic Soqotraen Boswellia species. Food Chem. 2011; 126(3): 1149-1154. Van Vuuren S, Kamatou G, Viljoen A. Volatile composition and antimicrobial activity of twenty commercial frankincense essential oil samples. S Afr J Bot. 2010; 76(4): 686-691. Hamedi A, Rivaz S, Mohagheghzadeh A. Pharmacognostic and preliminary phytochemical investigation on Doronicum scorpioides Roots. Iranian J Pharmaceut Sci. 2012; 8(4): 257-262. Kumar VP, Chauhan NS, Padh H, Rajani M. Search for antibacterial and antifungal agents from selected Indian medicinal plants. J Ethnopharmacol. 2006; 107(2): 182-188. Clinical and Laboratory Standards Institute. Performance standards for antimicrobial disk susceptibility tests; approved standard CLSI M2-A9. Wayne: Clinical and Laboratory Standards Institute, 2006. Clinical and Laboratory Standards Institute. Methods for dilution antimicrobial susceptibility tests for bacteria that grow aerobically; approved standard CLSI M7-A7. Wayne: Clinical and Laboratory Standards Institute, 2006. Clinical and Laboratory Standards Institute. Reference method for broth dilution antifungal susceptibility testing of filamentous fungi; approved standard CLSI M38-A. Wayne: Clinical and Laboratory Standards Institute, 2006. Zomorodian K, Saharkhiz M, Rahimi M, Bandegi A, Shekarkhar G, Bandegani A, Pakshir K, Bazargani A. Chemical composition and antimicrobial activities of the essential oils from three ecotypes of Zataria multiflora. Pharmacogn Mag. 2011; 7(25): 53-59. Fidel PL, Vazquez JA, Sobel JD. Candida glabrata: review of epidemiology, pathogenesis, and clinical disease with comparison to C. albicans. Clin Microbiol Rev. 1999; 12(1): 80-96. Malani A, Hmoud J, Chiu L, Carver PL, Bielaczyc A, Kauffman CA. Candida glabrata fungemia: experience in a tertiary care center. Clin Infect Dis. 2005; 41(7): 975-981. Marichal P, Bossche HV, Odds FC, Nobels G, Warnock DW, Timmerman V, Van Broeckhoven C, Fay S, Mose-Larsen P. Molecular biological characterization of an azole-resistant Candida glabrata isolate. Antimicrob Agents Ch. 1997; 41(10): 2229-2237. Miyazaki H, Miyazaki Y, Geber A, Parkinson T, Hitchcock C, Falconer DJ, Ward DJ, Marsden K, Bennett JE. Fluconazole resistance associated with drug efflux and increased transcription of a drug transporter gene, PDH1, in Candida glabrata. Antimicrob Agents Ch. 1998; 42(7): 1695-1701. Krogh-Madsen M, Arendrup MC, Heslet L, Knudsen JD. Amphotericin B and caspofungin resistance in Candida glabrata isolates recovered from a critically ill patient. Clin Infect Dis. 2006; 42(7): 938-944. Thompson GR, Wiederhold NP, Vallor AC, Villareal NC, Lewis JS, Patterson TF. Development of caspofungin resistance following prolonged therapy for invasive candidiasis secondary to Candida glabrata infection. Antimicrob Agents Ch. 2008; 52(10): 3783-3785. Walsh T, Merz W. Pathologic features in the human alimentary tract associated with invasiveness of Candida tropicalis. Am J Clin Pathol .1986; 85(4): 498-502. Kontoyiannis DP, Vaziri I, Hanna HA, Boktour M, Thornby J, Hachem R, Bodey GP, Raad II. Risk factors for Candida tropicalis fungemia in patients with cancer. Clin Infect Dis. 2001; 33(10): 1676-1681. Silva S, Negri M, Henriques M, Oliveira R, Williams DW, Azeredo J. Candida glabrata, Candida parapsilosis and Candida tropicalis: biology, epidemiology, pathogenicity and antifungal resistance. Fems Microbiol Rev. 2012; 36(2): 288-305. Yang Y-L, Ho Y-A, Cheng H-H, Ho M, Lo HJ. Susceptibilities of Candida species to amphotericin B and fluconazole: the emergence of fluconazole resistance in Candida tropicalis. Infect Control Hosp Epidemiol. 2004; 25(1): 60-64. Al-Fattani MA, Douglas LJ. Biofilm matrix of Candida albicans and Candida tropicalis: chemical composition and role in drug resistance. J Med Microbiol. 2006; 55(1): 999-1008. Ali NAA, Wurster M, Lindequist U. Chemical composition of essential oil from the oleogum resin of Commiphora habessinica (Berg.) Engl. from Yemen. J Essent Oil Bear Pl. 2009; 12(2): 244-249. Medeiros JR, Campos LB, Mendonça SC, Davin LB, Lewis NG. Composition and antimicrobial activity of the essential oils from invasive species of the Azores, Hedychium gardnerianum and Pittosporum undulatum. Phytochemistry. 2003; 64(2): 561-565. Burt S. Essential oils: their antibacterial properties and potential applications in foods-a review. Int J Food Microbiol. 2004; 94(3): 223-253. Ghasemi Y, Faridi P, Mehregan I, Mohagheghzadeh A. Ferula gummosa fruits: an aromatic antimicrobial agent. Chem Nat Compd. 2005; 41(3): 311-314. Hanuš LO, Řezanka T, Dembitsky VM, Moussaieff A. Myrrh-commiphora chemistry. Biomed Pap. 2005; 149(1): 3-28. Dolara P, Corte B, Ghelardini C, Pugliese AM, Cerbai E, Menichetti S, Nostro AL. Local anesthetic, antibacterial and antifungal properties of sesquiterpenes from myrrh. Planta Med. 2000; 66(04): 356-358. Manguro LOA, Ugi I, Lemmen P. Further bisabolenes and dammarane triterpenes of Commiphora kua resin. Chem Pharm Bull. 2003; 51(5): 479-482. Brakhage AA. Systemic fungal infections caused by Aspergillus species: epidemiology, infection process and virulence determinants. Curr Drug Targets. 2005; 6(8): 875-886. Almirante B, Rodríguez D, Cuenca-Estrella M, Almela M, Sanchez F, Ayats J, Alonso-Tarres C, Rodriguez-Tudela JL, Pahissa A. Epidemiology, risk factors, and prognosis of Candida parapsilosis bloodstream infections: case-control population-based surveillance study of patients in Barcelona, Spain, from 2002 to 2003. J Clin Microbiol. 2006; 44(5): 1681-1685. Loreto ÉS, Scheid LA, Nogueira CW, Zeni G, Santurio JM, Alves SH. Candida dubliniensis: epidemiology and phenotypic methods for identification. Mycopathologia. 2010; 169: 431-443. Krcmery V, Barnes A. Non-albicans Candida spp. causing fungaemia: pathogenicity and antifungal resistance. J Hosp Infect. 2002; 50(4): 243-260. Camarda L, Dayton T, Di Stefano V, Pitonzo R, Schillaci D. Chemical composition and antimicrobial activity of some oleogum resin essential oils from Boswellia spp. (Burseraceae). Ann Chim. 2007; 97(9): 837-844. Weckesser S, Engel K, Simon-Haarhaus B, Wittmer A, Pelz K, Schempp C. Screening of plant extracts for antimicrobial activity against bacteria and yeasts with dermatological relevance. Phytomedicine. 2007; 14(7): 508-516.